A couple of weeks ago one of us (MG) attended the biannual Hospice New Zealand conference in Auckland where there was a discussion session responding to the question ‘Do old people matter?’ The general feeling amongst delegates was that, of course they matter, or for some, of course we matter. The answer to the question was regarded to be self-evident; no debate was needed. However, it leaves us with the question as to whether this was actually an accurate representation of delegates’ underlying beliefs, or indeed of those held by society as a whole. On reflection, maybe not. Whilst we may all fervently believe that we aren’t ageist and castigate explicit examples of ageism, negative connotations of ageing are so deep rooted in our society that they are difficult to escape. We would argue that even those of us working in a field such as palliative and end of life care aren’t immune to such charges. For example, older people are less likely than younger people to have access to specialist palliative care and more likely to die in settings where concerns have been raised about the quality of end of life care provided, notably hospitals and care homes. This is despite the fact that age shouldn’t dictate levels of palliative care need experienced. Rather, the current patterns of care reflect deep-rooted ageism, both in terms of individual clinician patterns of referral to specialist palliative care, and in relation to more subtle practices within society. Indeed, whilst we may all struggle against the charge of ageism, ultimately we tolerate the ‘warehousing’ of older people in institutions where good care is so poorly valued that staff (predominantly unregulated and unregistered), typically receive little more than the minimum wage to look after some of the most vulnerable people in our societies at the end of their lives. We were left wondering whether things have got better or worse in terms of end of life care for older people over time. Was there ever really a ‘golden age’ where communities revered their older members and cared for them collectively up until death? Allan Kellehear argues that this overly romanticised historical picture bears little relation to the realities of abandonment and mercy killing of older people practised by our hunter-gatherer ancestors. Like us, they saw frail older people as a problem for society, although he argues that unlike us, they viewed dying as an inevitable part of living. He concludes that recognising the inevitability of dying and discussing it within our families and communities, as well as at a service and policy level, is fundamental to ensuring a humane response to the growing demand for end of life care for our ageing populations. And what is apparent is that the need is growing. Internationally the number of people dying annually will almost double over the next 30 years. Fifty six million people died in 2009; 91 million are likely to die in 2050. For developed countries, the ageing and dying of the ‘baby boomers’ will possibly be the greatest public heath challenges of this century. Many people say that they would want to die without warning, ‘in their sleep.’ The reality is that most people will have protracted deaths, linked to a combination of long term conditions and having to cope with co-morbities, including cognitive frailty. The UK report ‘Dying for Change’ (2010) argues that society is ill-prepared for how caring for the dying will change in the next two decades as people live longer. The co-author of this report, Charles Leadbetter, warns us that: “confronting, managing and experiencing death are among the most difficult, painful and troubling issues we face.” As Paul Cann notes we need to put end of life care in the middle of our lives: this is everybody’s business. 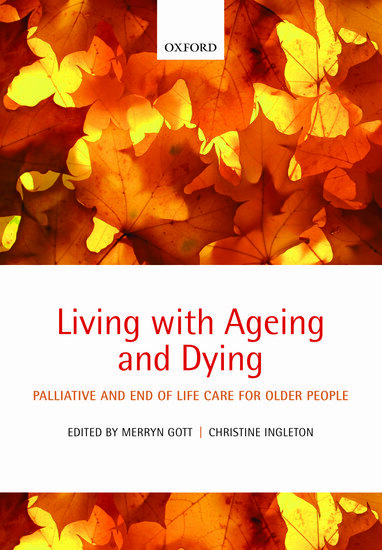 Merryn Gott and Christine Ingleton are the editors of Living with Ageing and Dying: Palliative and End of Life Care for Older People. Merryn Gott joined the University of Auckland in 2009 as Professor of Health Sciences in the School of Nursing. Her PhD is in gerontology and over the last 12 years she has developed an international programme of research exploring palliative and end of life care for older people. Christine Ingleton is Professor of Palliative Care Nursing in the School of Nursing & Midwifery at the University of Sheffield. She has contributed to 30 research grants and awards totalling over L3.5 million. She has published over 90 outputs in peer reviewed journals and contributed to 6 books on health services research. 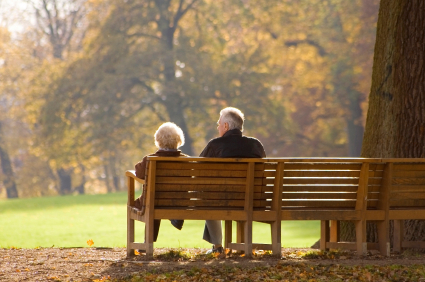 Image credit: old couple sitting on bench in park, autumn. Photo by sculpies, iStockphoto.